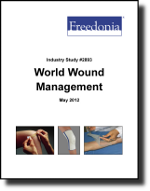 World demand for wound management products will increase 5.3 percent annually to $39.3 billion in 2016. China will be the fastest growing market. Developed countries, led by the US, will remain a much larger market than developing countries. Wound healing agents and wound dressings will be among the fastest growing products. This study analyzes the $30.3 billion world wound management product industry. It presents historical demand date for the years 2001, 2006 and 2011, and forecasts for 2016 and 2021 by type (e.g., wound closures, bandages, wound dressings, wound healing agents), world region and for 10 major countries. The study also considers market environment factors, details industry structure, evaluates company market share and profiles 41 industry players, including Johnson & Johnson, Covidien and Kinetic Concepts.